Scientists studying longevity believe a gene could explain why some animals live longer. In 18 species of rodents with varying life spans, researchers looked at sirtuin 6 (SIRT6), a gene that plays a role in bodily processes such as aging, cellular stress resistance and DNA repair. Over time, DNA inevitably suffers what are known as double-strand breaks (DSBs) that can cause genes to mutate, triggering aging and diseases like cancer. To answer whether SIRT6 works harder in species that live longer, the team studied 18 rodents, from mice expected to live around three years to beavers and mole rats with life expectancies of up to 32 years. Animals with stronger SIRT6 proteins were found to live longer. This was also apparent when they compared the molecular differences in the SIRT6 proteins of mice and beavers. And by dosing human cells and fruit flies with the SIRT6 from a mouse and a beaver, as expected, the scientists found the beaver protein was more potent than the mouse protein. Rochester, N.Y. – From Hollywood to Healthcare: Technology used to make movies is being used at the University of Rochester Medical Center to help scientists understand the brain and how it ages. What researchers learn could help predict a person’s risk of developing Alzheimer’s disease. 13WHAM watched researchers in the Mobile Brain Body Imaging – or MoBi – Lab attach wires to a cap covered in electrodes. The cap picks up the brain wave activity of a volunteer, while infrared cameras surrounding him pick up how his body moves on a treadmill. This lab is one of 12 around the world combining motion capture technology with brain scans used in real time. Armed with that information, doctors hope to one day be able to predict a person’s dementia risk a decade before symptoms show up. It can also help give us clues about a person’s risk of falling as they get older. Check it out at sciencemag.org/careers. Have you joined the University of Rochester’s online community to connect with alumni, students, faculty, and staff? The Meliora Collective goes beyond what social media networks offer - an exclusive University of Rochester community of alumni, students, parents and friends who want to make meaningful connections for personal and professional exploration and growth. Check out a short video on the Collective at vimeo.com/289733971 . Sign up and join the Collective at thecollective.rochester.edu/. 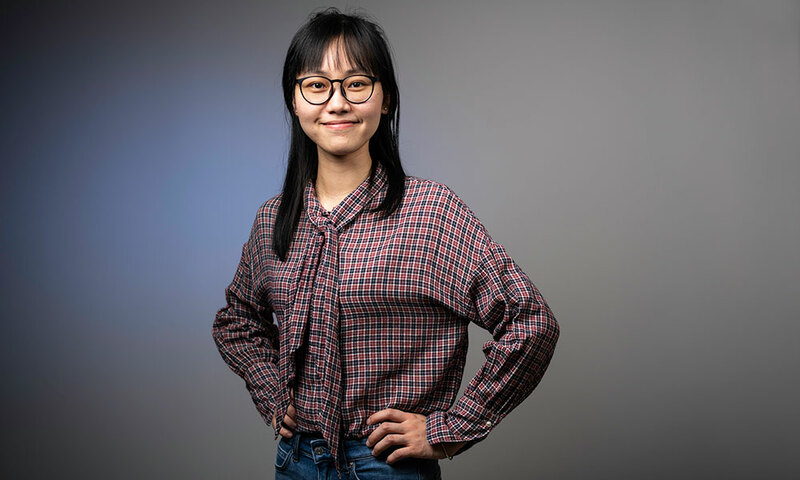 University of Rochester graduate student Beixi Li has been named a 2019-20 Schwarzman Scholar, one of about 140 selected worldwide for this prestigious graduate fellowship. She’ll develop leadership skills and professional networks in a one-year master’s program at China’s elite Tsinghua University in Beijing, beginning next August. The international fellowship was established in 2016 with a $100 million donation by philanthropist Stephen Schwarzman, whose goal was to prepare the next generation of global leaders by providing an unparalleled opportunity to gain some understanding of China through an immersive experience. Students pursue a master’s degree in global affairs, with concentrations in public policy, economics and business, or international studies. They spend a year in an international community of thinkers, innovators, and leaders in business, politics, and society. Nearly 2,900 candidates from around the world applied. Li is currently pursuing a master of public health degree at Rochester’s School of Medicine and Dentistry and expects to graduate in May. Her thesis examines the potential impact of maternal dental amalgams (fillings) on offspring neurodevelopment. As a Schwarzman Scholar, Li intends to concentrate in public policy. She plans a career in preventive medicine, with a focus on children, in the fields of environmental hazards, tobacco control, or infectious diseases. Li is the first Rochester recipient since Jintian (Jay) Li ’12 (no relation) was selected to the inaugural class. Suman Kumar ’19, a mechanical engineering major from Lalitpur, Nepal, was a Schwarzman Scholar semifinalist and one of around 400 who reached the interview stage of the competition. “We are delighted and proud to have another Rochester student join the ranks of Schwarzman Scholars and hope that Beixi’s selection will inspire more students, including those in graduate and professional degree programs, to consider applying in the future,” says Belinda Redden, director of the Fellowships Office. Li earned her undergraduate degree in preventive medicine from Xiangya School of Medicine at Central South University in Changsha, China, and is a licensed medical doctor in her native country. She began her Rochester graduate study program in fall 2017. Recently the US News and World report website published an article discussing what you can do with a biology degree. The article features input from URBEST Executive Director, Tracey Baas. Read More: US News and World Report Article: What You Can Do With a Biology Degree? In this seminar, Propel Careers will provide insight on the job search process and what companies look for when evaluating talent. Propel will discuss the importance of tailoring a resume and cover letter for a specific position. Propel Careers will also discuss how companies utilize resume databases and LinkedIn to identify talent. Propel will provide tips on how candidates can standout from the crowd. For more information about this event, please contact CPD-SMD-Grad@URMC.Rochester.edu. Trainees can also register and via the webinar by visiting the Gotowebinar site. Professor of Pharmacology and Physiology, Jean Bidlack, Ph.D. and her research were recently featured on WXXI's Second Opinion. 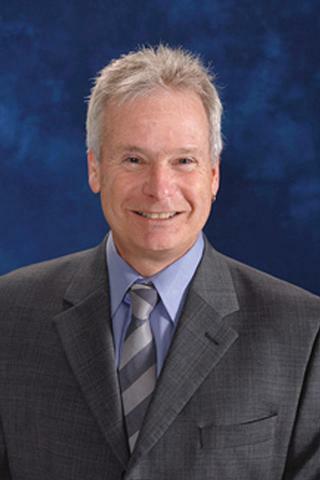 The Medical Innovations segment will air with the "Alcoholism" episode on WXXI where Dr. Bidlack discusses how when dopamine levels spike in the brain, it leads to the very strong reinforcing properties of addiction. The program will air Thursday January, 3rd at 8:30pm but can be viewed below as well. Congratulations to Phong Nguyen and Jose Suarez Loor for receiving ORS Travel Awards! Two travel reimbursement awards of up to $1,000 will be given this funding cycle (one for clinical research and one for basic sciences research) to support a University of Rochester School of Medicine & Dentistry medical student, graduate student, postdoctoral trainee, clinical resident, and/or clinical fellow to attend important national or international meetings at which they will present their research and make professional connections. Eligible applications for the current cycle are for travel between September 1, 2018 and February 28, 2019. Submission Deadline: Friday, December 14, 2018, 6:00 pm. For questions, email Amy Blatt, M.D. or call 585-275-4912. We celebrated the successful PhD defense by Eugene Kim last Friday. Working with Jianwen Que, Eugene has identified a significant progenitor cell population in the early foregut. She used a combination of xenopus and mouse models to demonstrate that the transcription factor Isl1 enriched in the unique progenitor population regulates the separation of the esophagus from the trachea. These findings provide important insights into the pathobiology of a relatively common birth defect esophageal atresia with/without trachea-esophageal fistula (EA/TEF). Eugene has a passion for studying developmental biology and stem cells in regeneration, and she plans for a future career in these areas! Wish the four winners a hardy congratulations when you see them. On Thursday, Fanju Meng successfully defended his PhD thesis. 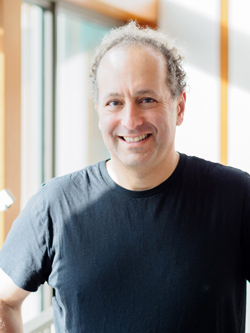 Under mentorship of Dr. Benoit Biteau, Fanju’s studies focus on the regulatory network that coordinates stem cell proliferation and differentiation in the Drosophila intestinal epithelium. Using advanced fly genetics and cell biology methods, Fanju characterized the expression and role of several transcription factors in adult intestinal progenitors. His work significantly improves our understanding of the programs controlling stem cell function and establishes the fruit fly as a model to study these conserved, critical stem cell factors. His findings have been published in Cell Reports and Stem Cell Investigation. And there are additional papers in the pipeline! Fanju was a recipient of a NYSTEM training grant hosted by the Department of Biomedical Genetics, and the Goodman Doctoral Dissertation Fellowship from the University of Rochester. Fanju is now planning on continuing in his work in the field of stem cell and cancer biology using genetic model organisms – and we wish him the best of luck! You will be missed. Last week GDSC held our Halloween Costume Contest. Our three GDSC student contestants can be seen below. Our graduate program in Genetics, Development and Stem Cells (GDSC) celebrated another successful season of research and academic growth. 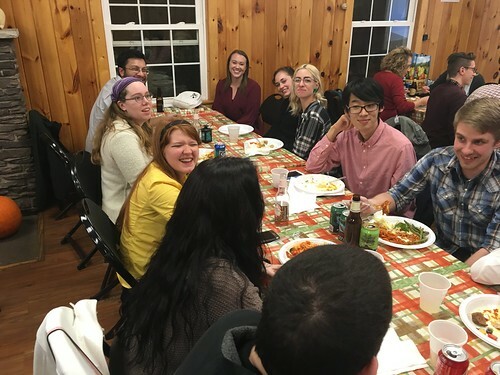 On the afternoon of Friday October 26th 2018, the faculty, students and families of GDSC held our Fall Retreat at the Ellison Park Pavilion Lodge. Among our many reasons to celebrate was our Department’s recent faculty expansion including, Brian J. Altman, Stephano Spano Mello, and Patrick J. Murphy. Welcome! We also celebrated the faculty promotion of Benoit Biteau to Associate Professor. Finally, we celebrated the future research of faculty members Margot Mayer-Pröschel, Douglas Portman, Chris Pröschel, and Andy Samuelson each of whom obtained prominent research grants earlier this year. Our festivities included pumpkin carvings, board games and a cocktail hour. There were also three hotly contested rounds of Science Trivia. (The final scores for the first and second place teams were separated by a margin of half a point!) The winning team “Smooth ER” included members Derek Crow, Li Xie, Shen Zhou, Yungeng Pang, Mark Noble, Daxiang Na, and Andy Samuelson. Additionally, Jessie Hogestyn won our “Hidden Facts” contest testing one’s knowledge of eccentric or esoteric trivia regarding GDSC faculty and students. Photos of GDSC’s genetic festivities can be seen below. Edward Ayoub, a Graduate student in the Cellular and Molecular Pharmacology and Physiology PhD Program and member of Archibald Perkins Lab published in Nature Communications on 10/12/2018. More information can be found on the Nature Website. Inv(3q26) and t(3:3)(q21;q26) are specific to poor-prognosis myeloid malignancies, and result in marked overexpression of EVI1, a zinc-finger transcription factor and myeloid-specific oncoprotein. Despite extensive study, the mechanism by which EVI1 contributes to myeloid malignancy remains unclear. Here we describe a new mouse model that mimics the transcriptional effects of 3q26 rearrangement. We show that EVI1 overexpression causes global distortion of hematopoiesis, with suppression of erythropoiesis and lymphopoiesis, and marked premalignant expansion of myelopoiesis that eventually results in leukemic transformation. We show that myeloid skewing is dependent on DNA binding by EVI1, which upregulates Spi1, encoding master myeloid regulator PU.1. We show that EVI1 binds to the −14 kb upstream regulatory element (−14kbURE) at Spi1; knockdown of Spi1dampens the myeloid skewing. Furthermore, deletion of the −14kbURE at Spi1 abrogates the effects of EVI1 on hematopoietic stem cells. These findings support a novel mechanism of leukemogenesis through EVI1 overexpression. A couple of weeks ago, I gave a presentation at the URBEST retreat, entitled “Mentoring Lessons: What my students have taught me”. It was a Pecha Kucha style talk - 20 slides, 20 seconds each; a little over 6 minutes total. My ratio of prep time to presentation time was frightening. But the process of constructing the talk was incredibly rewarding, because it forced me to reflect on the moments when my students have shown me - through their words and actions - what matters most. I’m referring to those moments when others teach us something important about ourselves, about our interconnectedness, and even about the workplace culture we aspire to create around us. We’ve all experienced moments like these. Moments that, even years later, can still inspire tears and feelings of deep gratitude. As I was putting my slides together, I got to thinking about Tony Broyld - who I first met as a middle schooler at Clara Barton School #2 in the City of Rochester. He's now a Systems Engineer in his early 30s with two M.S. degrees from the University of Rochester and living in the greater New York City area. He is also the first member of his family to go to college. Someone in whose life I was fortunate enough to make a real and profound difference and also someone who taught me a great deal about resilience. If he were the only student who taught me something important about values, about what matters, this would be a short column. But of course, he wasn’t. Almost every day, I find myself in awe of the people I’m privileged to work with. Recently, I attended the annual picnic in my home department of Microbiology and Immunology. One of our students spoke to me about her journey to graduate school. How the kindness of a single mentor changed the course of her life, made her believe in herself, helped her see a different future, and brought her here to Rochester. She spoke also about her father and how he will spend the rest of his life in jail, a measure of how far her life has traveled from the path that it might otherwise have gone down. She spoke from a place of love and appreciation - and left me feeling intensely honored to be a part of her education. There are hundreds of stories like hers at our Medical center from people whose lives have been transformed by the power of their own courage and by the drive of their imagination and curiosity. By their desire to learn, by this life in science that we share, and by the values that we talk about -- but don’t always appreciate or fully understand – until we see them up close and personal. The Wojtovich lab attended the Translational Research in Mitochondria, Aging, and Disease (TRiMaD) Symposium. A yearly event that brings together approximately 150-200 scientists from the Northeast to discuss the role of mitochondria in aging and disease. Adrian (’18 University of Alcalá, Spain), one of three new 2018 recruits to the GDSC program was awarded the Graduate Alumni Convocation Award to recognize his promise for exceptional accomplishment in graduate studies. During his year of studying abroad at Tufts during 2017-2018, Adrian worked in the Mirkin lab to study the role of cdc13 mutations in genome instability. In addition, Sarah Spahr (’18 Ohio State University) was nominated for the Irving Spar Fellowship and Tom O’Connor (’17 University of Buffalo) was nominated for the Newell Stannard Graduate Student Scholarship Award. Congratulations to all three! Students and faculty from Biomedical Genetics and the GDSC program attended the 6th Wilmot Cancer Institute Warrior Walk on Sunday. 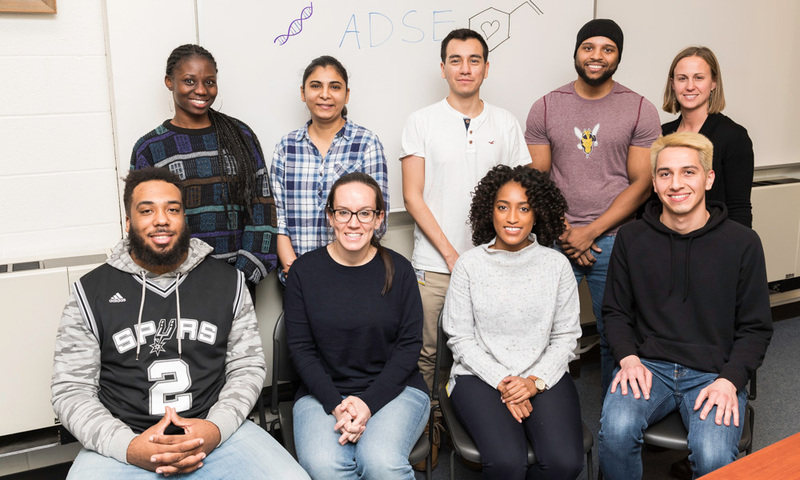 Aptly named the “NextGen Cancer Busters” to symbolize the graduate students and post-docs training to become cancer researchers, the GDSC team mingled with cancer survivors and family members, to support the fight against cancer. As one team member pointed out: “Meeting cancer survivors really helps put the work in the lab into perspective”. In addition to the Cancer Survivor Walk, “NextGen Cancer Busters” also participated in the 10k and 5k events. Notably, Dalia Ghoneim (5k) and Adam Cornwall (10k) and placed 1st and 2nd in their group, and 2nd and 7th overall. In addition, Scott Friedland and our new faculty addition, Brian Altman, both placed 4th in their age group for the 5k. Congratulations!! Emily Warner was recently selected to receive a 2018 Trainee Professional Development Award (TPDA) from the Society for Neuroscience. These are highly competitive awards and it is a great achievement for Emily. The award comes with a complementary registration to the conference in San Diego and a monetary award of $1000. 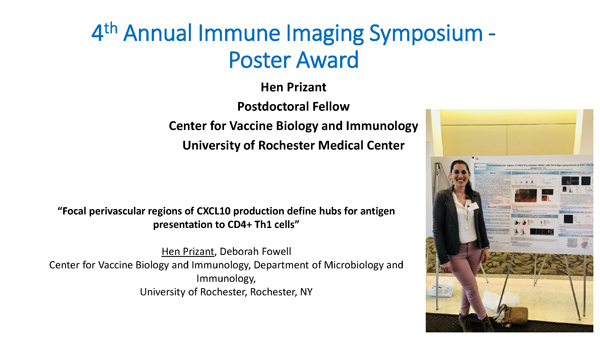 Emily will present a poster at a poster session for other recipients and will be able to attend several Professional Development Workshops while at the conference. Congratulations to our NGP students for again earning these honors at this year's School of Medicine and Dentistry Convocation Ceremony. This fellowship was established in 1991 from Mr. and Mrs. Merritt Cleveland and is awarded to a Ph.D. student entering graduate study through the Biomedical Sciences Program with interest in developing a neuroscience-related research career. This award, established in 2015, recognizes a student mentor who guides, supports and promotes the training and career development of others. This scholarship was established by Dr. Stannard, Professor Emeritus, to recognize one deserving incoming graduate student for their commendable academic achievements. Dr. Stannard developed the world’s first doctoral program in radiation biology at the School of Medicine and was a faculty member for almost 40 years before retiring in 1975. He taught and mentored hundreds of students who went on to become leaders and experts in the field of radiation health. Almost all of us, as researchers, spend a good deal of our time thinking about grant proposals. That’s because grant funding gives us the means to explore our ideas, and to do the things we think are important. We also all recognize that most grant applications will be rejected by the funding agencies to which we submit them. So we become creatures of persistence. What’s discussed less often, is the actual experience of grant writing. Its something we all do: at our desks, in coffee shops, at the kitchen table; wherever we can find a space for our laptop. But we don’t often talk about how it feels. There’s a strong sense of stepping out of your normal life. For me - and I don’t think I’m unusual in this - it involves withdrawing from many of the other things I would normally do. Not only professionally, but also family obligations and social interactions. This column, for example, was due a week ago. But I deferred it, because I had a grant deadline yesterday. Grant writing requires us to focus our thoughts to such an extent that we can sink into them; to become fully immersed. The experience is intense, and it is also both lonely and isolating. That’s because the process of writing a grant is an exercise in disconnection. An intentional unplugging. When I’m writing a grant, I often feel very distant from the people around me. It’s as if they’re behind glass - because my mind is somewhere else entirely. And then I’ll find myself alone in a quiet house, in the middle of the night, with nothing but my own thoughts for company. Struggling to find the right words. What makes this more bearable is remembering why we’re asking for the money - what we plan to do with it - and knowing also that this is a shared experience, common to all academic scientists. It’s a part of the life we choose. Those late nights, those doubts, those uncertainties - we’ve all been there. It’s one of the things that bond us together. So I wanted to take a moment to acknowledge the hundreds of researchers at the medical center who are engaged in grant writing on any given day. It’s their efforts that make the URMC’s research enterprise possible, and that make this a special place where discoveries happen every day. Richard T. Libby Ph.D., professor of Ophthalmology and of Biomedical Genetics at the University of Rochester School of Medicine and Dentistry, and a member of the University’s Center for Visual Science, has been named Senior Associate Dean for Graduate Education and Postdoctoral Affairs (GEPA), pending approval of the University Board of Trustees. Beginning Sept. 1, Libby will direct the School of Medicine and Dentistry’s Ph.D., postdoctoral and master’s degree programs. He succeeds Edith M. Lord, Ph.D., who served a decade in the role and is shifting her focus to microbiology and immunology research. An innovative researcher in the neurobiology of glaucoma, Libby arrived in Rochester in 2006 after postdoctoral and fellowship experiences that enlightened him on the power of model genetics systems in the study of eye disease. Years spent training at the Medical Research Council’s Institute for Hearing Research in Nottingham, England, and the Jackson Laboratory in Bar Harbor, Maine, formed the foundation for his current laboratory, which is focused on understanding the cell signaling pathways that lead to vision loss in glaucoma. 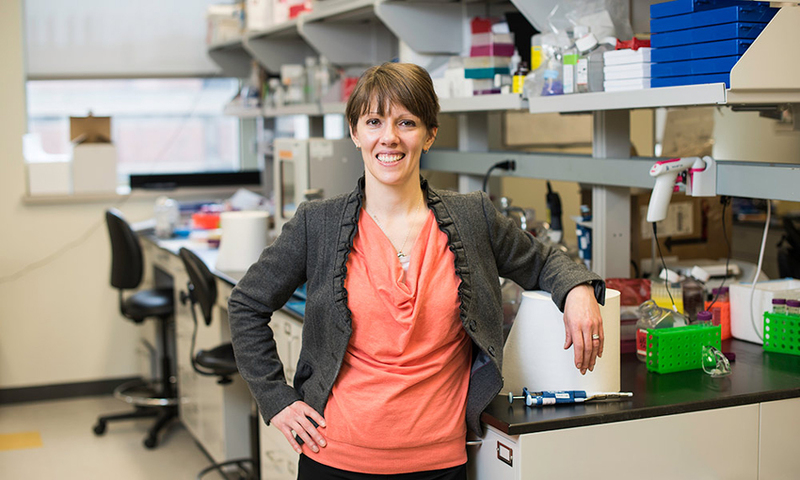 Libby is director of the Cell Biology of Disease Graduate Program, has served on numerous academic committees integral to research activities and graduate education, and is a respected mentor and teacher. He has published, as author or co-author, more than 60 peer-reviewed scientific articles and numerous reviews, book chapters and commentaries, and has presented internationally on a range of topics in eye and vision research. Libby received a doctorate degree in biology from Boston College in the field of neurodevelopment. He was a postdoctoral fellow at the Medical Research Council’s Institute for Hearing Research in Nottingham England, and a postdoctoral fellow at the Jackson Laboratory in Bar Harbor, Maine. 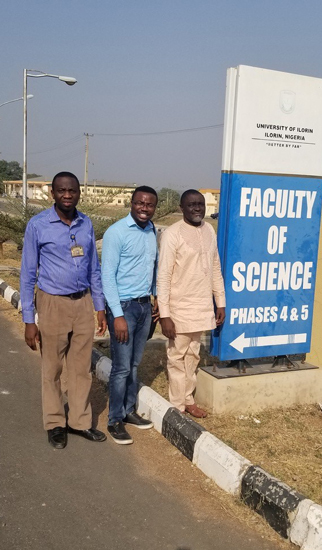 He joined the School of Medicine and Dentistry faculty as an assistant professor in 2006, was named associate professor in 2012, and professor in 2018. Lord’s four-decade career in Rochester is dotted with milestones and accomplishments. She joined the School of Medicine and Dentistry faculty as a senior instructor in 1976 and rose through the ranks to professor in 1994. In 10 years as Senior Associate Dean, she worked to improve the experience of graduate students and postdocs in and outside the lab, adding Postdoctoral Affairs to the Office for Graduate Education’s name, standardizing salaries and benefits, and advocating on behalf of trainees. She spearheaded a revamping of the fundamental basic science courses, incorporating more workshops and active learning components and emphasizing team-based science. She also fostered professional development initiatives and guided efforts to support students’ health and wellbeing. Her return to the research lab will include focusing on an NIH grant to study the immune response in tumors. URMC neurologist Ralph Jozefowicz, M.D., has been awarded the American Academy of Neurology’s (AAN) Leading in Excellence through Mentorship award. He received the recognition at the AAN’s 2018 annual meeting. Jozefowicz, a professor of Neurology and Medicine, is a nationally recognized leader and innovator in neurologic education and has received numerous awards and accolades from AAN, the American Neurological Association, the Fulbright Program, the Association of American Medical Colleges, and Jagiellonian University in Poland for his work in the field. He currently serves as director for the second year medical student "Mind, Brain and Behavior" course and co-director of the third year Neurology Clerkship. He is also the Neurology Residency Program Director at the URMC. You can read more about the award and perspectives from colleagues he has mentored over the years in Neurology Today. August 10, 2018 marked the Medical Scientist Training Program’s 18th Annual Retreat. The retreat was held at the Rochester Yacht Club, overlooking Lake Ontario and the Genesee River. The Annual Retreat is an opportunity for the entire program to touch base and welcome incoming students. This year, the MSTP welcomed 8 new students: Catherine Beamish, Wash U., Zachary Christensen, UR 2nd year med. (Brigham Young U. ), Ankit Dahal (U. Penn), Adam Geber (Columbia U. ), Emily Isenstein (Cornell U. ), Bryan Redmond (Xavier U. ), Alison Roby (Penn St.), Matt Sipple (Cornell U.). The Keynote this year (“Iterations of cross-talk direct differentiation in development”) was given by former URMC MSTP Student, Alan P. Kenny, MD, PhD, Assistant Professor, Pediatrics (Neonatology) at the University of Cincinnati Children’s Hospital, Cincinnati, OH. Dr. Kenny focuses his research on elucidating the molecular mechanisms controlling the earliest stages of respiratory and digestive organ development. Available evidence suggests that early lung, liver, and pancreas lineages develop from a pool of foregut progenitor cells in the ventral endoderm. They are induced by FGF and BMP signals emanating from the cardiogenic mesenchyme during early somite stages of development through a mechanism that is highly conserved among vertebrates. Following the keynote, the morning science session concluded with several short-format research talks by Mark Kenney(M2, lab rotation, Summer 2018 - Edward Schwarz, PhD), Jonathan Gigas (G1, Vera Gorbunova, PhD), Karl Foley ( G2, Houhui Xia, PhD), Matthew Tanner (G3, Charles Thornton, MD), Colleen Schneider (G4, Bradford Mahon, PhD), and Evan McConnell, PhD (M3, Maiken Nedergaard, DMD, PhD). After lunch, the program convened for a business meeting. Attendees of the Keystone MD/PhD Student Conference and the Class Council representative for American Physician Scientist Association (ASPA) reported on their trips to annual meetings and upcoming events. New Student Council members were elected at the end of the afternoon. After closing the meeting, MD/PhD students met for conversation and drinks overlooking the water. Another successful year for the program! Monique was selected by the Society for Neuroscience's Professional Development Committee and its Diversity in Neuroscience Subcommittee as a Neuroscience Scholars Program Fellow. This program is designed to provide underrepresented graduate students in neuroscience with career development and networking opportunities to help them with success going into the future. A mentoring team consisting of a senior mentor and a member of the Diversity in Neuroscience Subcommittee. The team will discuss a fellow's research, career plans, and overall experience. Two years of complimentary SfN membership. A travel award to attend the SfN annual meeting each fall during the two-year program. Up to $1500 in enrichment funds to support allowed professional development activities. Page-Turners for Teaching - discussion group for grad students, medical students, postdocs, and residents interested in exploring their teaching practice with like-minded colleagues! That's Just this week, there are opportunities, information and events going into September in the latest issue of Opportunities To Explore! The latest issue of opportunities to explore is out, packed with events, information and resources starting from next week and well into Summer, we also have an employment and internship opportunity advertised in this issue. Check it out! Edward Ayoub, graduate student in the laboratory of Dr. Archibald S. Perkins was awarded a two-year Ruth L. Kirschstein National Research Service Award (NRSA) Individual Predoctoral Fellowship entitled, “Therapeutic Strategies for Anemia in 3q26 Rearranged Leukemia”. According to the most recent NIH Cancer Statistics Review, leukemia, a cancer of blood cells, is the ninth most common type of cancer. Acute myeloid leukemia (AML) is an aggressive form of leukemia with high lethality (~75% of patients die 5 years after being diagnosed) characterized by anemia, and excessive proliferation of abnormal myeloid progenitor cells in the bone marrow (BM). Rearrangements of the chromosomal band 3q26 portend further reduction in survival, and lead to the overexpression of the oncogene Ecotropic Viral Integration Site 1 (EVI1). The severity of 3q26 rearranged AML, the lack of in-depth understanding of the role of EVI1 in leukemia, and the inadequate therapeutic strategies interested our lab and others to investigate EVI1 associated leukemogenesis. While previous groups used transplantation of BM virally transduced to overexpress EVI1, we are the first lab to recapitulate the effects of the 3q26 rearrangements in the mouse by establishing an inducible EVI1-overexpression model, which has provided us with new insights into the mechanisms by which EVI1 induces leukemia. We concluded using our in vivo and in vitro models that EVI1 causes myeloid expansion and blocks both erythropoiesis and lymphopoiesis. As an insight to the molecular mechanism, we previously documented that EVI1 binds to GACAAGATA, which overlaps with the binding site of the master regulator of erythropoiesis GATA-1. Additionally, our data indicate that EVI1 upregulates a previously published GATA-1 blocker, PU.1, and we showed that EVI1 binds to an enhancer upstream of PU.1 encoding gene (Spi-1). Thus, we hypothesize that EVI1 blocks erythroid differentiation by two mechanisms: 1) directly competing with GATA-1 for key genomic binding sites harboring EVI1/GATA-1 overlap motifs and 2) binding to Spi-1 enhancer and upregulating PU.1, which suppresses GATA1 function. We will investigate both hypothesized mechanisms using cutting edge techniques including ChIP-seq, ATAC-seq, and CRISPR under the training of my sponsor and collaborator. In order to translate the proposed mechanistic insights into clinical settings and therapeutic strategies, we will perform CRISPR library screening using an in vivo model to identify genes that reverse erythropoiesis blockage associated with EVI1-overexpression. In summary, this fellowship will focus on investigating erythropoiesis blockage and resulting anemia that might explain the increased lethality associated with 3q26 rearranged leukemia, and It will unveil new therapeutic strategies that reverse the leukemia-associated anemia. The latest issue of opportunities to explore is out, packed with events, information and resources starting from next week and well into August, we also have an employment and internship opportunity advertised in this issue. Check it out! Town hall meetings are being held to allow students to meet the candidates for Associate Dean for Graduate Education. Page-Turners for Teaching a new bi-weekly discussion group for grad students, medical students, postdocs, and residents interested in exploring their teaching practice with like-minded colleagues! Pride Parade - Walk with the University of Rochester in the 2018 pride parade will send a positive message of support to the LGBTQ community. For more information on this weeks events as well as many, many other opportunities, check out this weeks issue! One of the great pleasures of serving as Vice Dean for Research is the opportunity to learn about - and share - the cutting edge research that's being done here at the Medical Center. I've recently spoken with alumni, trustees and friends of the University across the country, as well as to key partners (and potential partners) for our new Empire Discovery Institute. Each time, it's been tremendous fun to have colleagues explain to me the science that most excites them - and to then watch how it resonates with diverse audiences. Today, I'm starting a new column that's intended to share some of the stories, breakthroughs and discoveries that are being made by the 3,000 researchers who work here. In diverse fields, ranging from neuroscience, to cancer immunotherapy, to musculoskeletal research, to RNA biology, and immunology and infectious disease, Medical Center researchers are at the forefront of their fields. For example: our basic scientists are unraveling the fundamental processes that regulate RNA metabolism and the trafficking of immune cells through tissue, while our Center for Health and Technology (CHeT) is working to enable anyone anywhere to receive care, participate in research, and benefit from resulting advances. Another area of remarkable strength is in augmented and virtual reality (AR/VR). Multi-disciplinary teams spanning computer science, engineering, neuroscience, ophthalmology and visual sciences are creating complex virtual environments that will enable us to better understand how the brain integrates sensory data, and how that can be used to treat a wide range of neurological and neuropsychiatric conditions. In the coming months, I hope to go into greater depth about these and other advances - and to share details of how Medical Center researchers are advancing our understanding of fundamental biological processes, translating discoveries into new treatments, and leading the way in improving clinical and population-level care. Congratulations to Isaac Fisher, a 5th year student in the laboratory of Dr. Alan V. Smrcka for receiving First Place in the Postbaccalaureate/Graduate Student category within the Division for Molecular Pharmacology! We applaud your contributions to ASPET’s 2018 Student Competition. The winners of the awards for the ASPET Student Poster Competition were announced at the Division Mixer on Tuesday, April 24 at EB 2018 in San Diego. Jonathan Bartko, MS has received a two-year Predoctoral Fellowship Award from the American Heart Association (AHA). Bartko is an MD/PhD candidate currently in his second year of the Cell Biology of Disease (Pathology) Graduate Program as part of the Medical Scientist Training Program (MSTP) at the University of Rochester. Rianne Stowell, a fourth year NGP graduate student, has been awarded a two year NIH Fellowship award (F31) for her project titled, “Noradrenergic modulation of microglial dynamics and synaptic plasticity”. Rianne works in the laboratory of Ania Majewska, Ph.D. The purpose of the Kirschstein National Research Service Award program is to enable promising predoctoral students with potential to develop into a productive, independent research scientists, to obtain mentored research training while conducting dissertation research. GoToWebinar - Career Path: "Negotiating Your Way to a Job in Academia"
That's just this week, there are several other Opportunities in the current issue, check it out! Monique S. Mendes, a neuroscience Ph.D. student, is the first University of Rochester Medical Center (URMC) graduate student to receive a prestigious diversity award from the National Institute of Neurological Disorders in Stroke (NINDS). Mendes works in the laboratory of Ania Majewska, Ph.D. and studies the role that the brain’s immune cells play in development, learning, and diseases like Autism. Mendes, originally from Kingston, Jamaica, received her undergraduate degree in Biology from the University of Florida. She came to URMC in search of a robust program that focused on glial biology and a collaborative environment. She chose the Del Monte Institute for Neuroscience to complete her thesis work due in part to Majewska’s record of mentoring students and her lab’s reputation for conducting leading research in brain development. 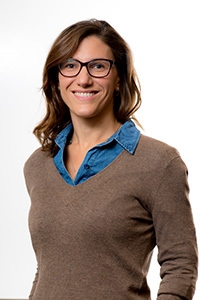 Mendes has been awarded a F99/K00 NIH Blueprint Diversity Specialized Predoctoral to Postdoctoral Advancement in Neuroscience (D-SPAN) fellowship from NINDS. The award was created to provide outstanding young neuroscientists from diverse backgrounds a pathway to develop independent research careers. Unlike traditional graduate student fellowships, this award provides research funding for 6 years, including dissertation research and mentored postdoctoral research career development. Read the local Jamacian Observer newspaper article. This week is the PREP Symposium, the PDA monthly meeting, mid-week brings the Online Career Conference for PhDs and on Thursday students and alumni can learn about The Meliora Collective the University's online network for Alumni and Students in the morning and attend the National Research Mentoring Network (NRMN) Career Development Webinar- Submitting to Journals for Publication in the afternoon. That's just this week, this issue contains events and opportunities covering June and July, click the link below to read more. 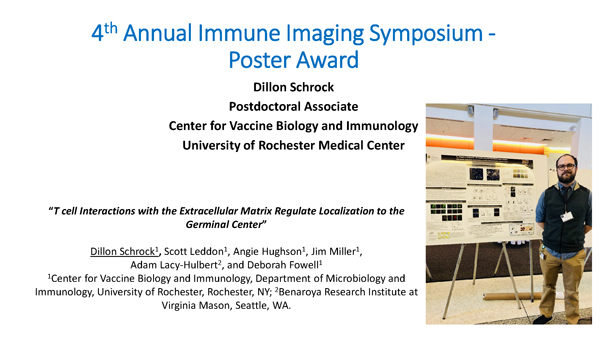 Congratulations to our most recent GSS poster session Travel Award Winners! Lara Terry, 3rd year student in David Yule Lab: 2nd place – Title: Effects of Missense Mutations on Inositol 1,4,5-trisphosphate Receptor Mediated Calcium Release. The latest issue of Opportunities to Explore is out. Get all the latest updates on events, grants, reading resources and more. 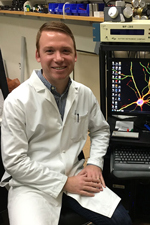 Fourth year NGP graduate student Patrick Miller-Rhodes (Gelbard lab) has recently published a single author review in Journal of Neuroscience (Journal Club, J Neurosci. 2018 38(19):4457– 4459) tackling the fascinating and timely topic of the heterogeneity of microglial mechanisms that contribute to normal brain functions such as synaptic plasticity. In this publication, Patrick highlights a recent study by NGP alumna Rebecca Lowery (Majewska lab; Glia 65(11):1744-1761), showing that microglial CX3CR1 loss does not affect multiple forms of plasticity, to make his point that the mechanisms microglia use to support neuronal function are likely diverse and differ based on brain region and developmental stage. Congratulations Patrick and go NGP! Each year, Arts, Sciences & Engineering and the School of Medicine and Dentistry recognize outstanding research and dissertations by PhD students. 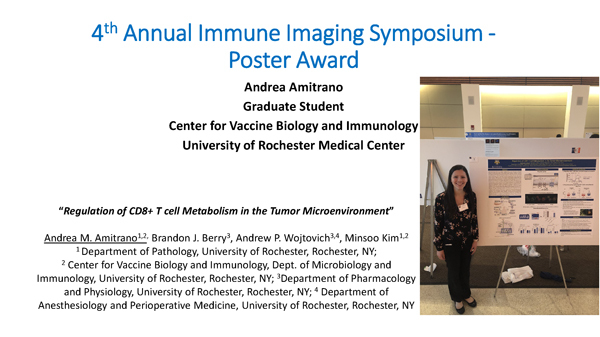 Vincent du Vigneaud Award: Anthony DiPiazza, Microbiology and Immunology, “Insights into CD4 T Cell-Mediated Immunity to Influenza Viruses.” The award is conferred by the Office of Graduate Education to a graduating student whose thesis is judged superior and unique in potential for stimulating and extending research in the field. Wallace O. Fenn Award: Benjamin Plog, Pathology, “Novel Insight into Regulation of Glymphatic Flow with Implications for Traumatic Brain Injury.” The award is given annually to a graduating student judged to have performed especially meritorious research and who presented a Ph.D. thesis suitable to honor the name of Wallace Fenn, former professor and chair of physiology. This week holds professional development day, a URBEST Career Story from Sarah Goodwin, PhD and the CIRTL@UR Research Day along with workshops on Strategies for Effective Clinical Teaching and Learning and The Bottom Line: What You Need To Know About Interviewing. There are many events, opportunities and resources in the latest issue, check it out! 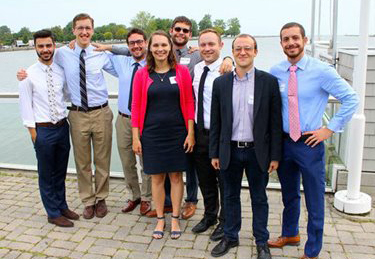 The MSTP 2017 incoming class, with former UR CTSI Academic Research Track participants Samuel Weisenthal and Ian De Andrea-Lazarus (far right). Over the past several decades, concerns have risen about the declining population of physician-scientists, with reports pointing to early career training and support as a possible solution. The UR CTSI Academic Research Track, which allows medical students to try their hands at research, has helped two University of Rochester School of Medicine and Dentistry students take the next step toward a research career: joining an MD-PhD program. 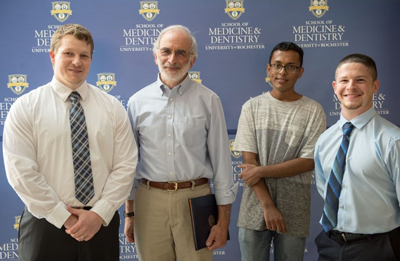 The pair, Ian De Andrea-Lazarus and Samuel Weisenthal, joined the University of Rochester Medical Scientist Training Program after finishing their Academic Research Track projects. This is a move that a new study from the Association of American Medical Colleges suggests will help them stay in science. The study tracked MD-PhD program graduates over 50 years and showed that most stuck with their research careers. 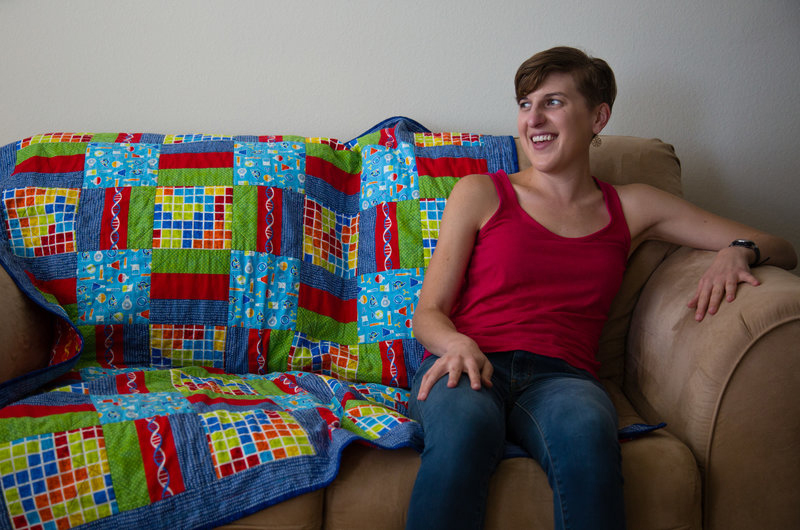 Ian and Sam explain what drove them to pursue a career as physician-scientists. Why did you join the UR CTSI’s Academic Research Track? Ian: I’ve always craved knowledge and enjoy the challenge of pushing the boundaries of existing human knowledge. I had several years of research experience before applying for medical school - as an undergraduate research assistant in the Linguistics Department at Gallaudet University and as a post-baccalaureate fellow at the National Cancer Institute. For two years, I worked in the Laboratory of Cancer Biology and Genetics at NCI, studying a non-selective cation channel found mainly in the peripheral nervous system that is involved in the transmission and modulation of pain. Sam: Like Ian, I was inspired by my time as a post-baccalaureate trainee at the NIH, where I worked for a year in a computational radiology lab. I also had a great time doing a summer research project in health informatics at Rochester. I joined the Academic Research Track because I wanted to study the vast amount of data being collected through the electronic health record. In a single year, the University of Rochester Medical Center alone accrues more than two terabytes of non-image data (a lot). I was particularly interested in how this data could be used to predict – and hopefully help prevent – adverse health events in patients. How did your experience in the Academic Research Track drive you to join the University of Rochester Medical Scientist Training Program? Ian: I had originally wanted to apply for the University of Rochester Medical Scientist Training Program but I was afraid that my application would not be competitive enough. The Academic Research Track was the bridge that allowed me to pursue my goal of becoming a physician-scientist and reinvigorated my interest in research. The program allowed me to obtain a master’s degree in Public Health along with the tools and drive I needed to apply for the MD-PhD program. Sam: I had also previously considered an MD-PhD program, but did not have a cohesive story to tell in an application. The Academic Research Track year allowed me to obtain a master’s degree in Data Science from the Goergen Institute for Data Science at the University of Rochester, which provided a foundation for more advanced study. It also helped me discover the UR CTSI’s Translational Biomedical Science PhD Program, which was a good fit, and to fully engage in a research project in a great lab. What did you study during the Academic Research Track program? Sam: We were initially interested in predicting readmission to the intensive care unit, which is a quality metric used by some hospitals. Ultimately, however, we decided to focus on predicting acute kidney injury, which is common, deadly, and sometimes completely preventable with simple interventions like fluid administration or medication review. Insights from our studies could be used to hopefully develop a better predictive tool that could help prevent acute kidney injury in the future. Ian: We explored the association between low levels of lead in the serum of 3- to 5-year-old children and their mental capacity to focus attention, remember instructions, and juggle multiple tasks. We used a well-characterized tool for assessing these mental executive functions in children, called the Stroop day-night task, but found that the tool may not be sensitive enough to detect lead’s effects on neurodevelopment. Sam: I am pursuing a joint degree between the Translational Biomedical Science PhD Program and Computer Science Department, with Computer Science as a minor. This includes select coursework in computer science, biostatistics, and medicine. My research focus is a continuation of my Academic Research Track project with Martin Zand, Ph.D., co-director of the UR CTSI and professor of Nephrology and Public Health Sciences at the University of Rochester Medical Center. Our goal is to improve acute kidney injury prediction by reformulating the standard approach and performing more rigorous error analysis. Ultimately, we hope to squeeze maximal predictive value out of electronic health record data to assist physicians in making the best decisions for at-risk patients. Ian: I am pursuing a doctoral degree in the UR CTSI’s Translational Biomedical Science PhD Program and working with John Foxe, Ph.D., Killian J. and Caroline F. Schmitt chair of Neuroscience, and Edward Freedman, Ph.D., associate professor of Neuroscience, on a mobile brain/body imaging (MoBI) study. We are interested in understanding how the brains of people with decreased cognitive function, like those with Alzheimer’s disease, handle the cognitive demands of multitasking while walking, which requires continuous processing of information about the environment and body position. Jennifer Mathews, PhD has been named the Associate Dean for the Albany College of Pharmacy and Health Sciences - Vermont Campus. Her responsibilities will include execution of the pharmacy program; supervision of faculty; campus operations; and coordination of the development, implementation, and assessment of initiatives that support the programs on the Vermont Campus, which also include a Master’s program in Pharmaceutical Sciences. This week features a webinar on renting in New York City, the Graduate Student Society (GSS) Coffee Hour, a CV/Resume workshop and the 5th Annual Alumni Networking Event, the work week ends with the Pre-doctoral Organization for the Neurosciences (PONS) Luncheon Roundtable Series and the weekend brings commencement for Doctoral and Master Degree Students. Congratulations to all of our graduates! Opportunities to Explore has Events and Grant, Travel Award, and Conference Information into June and beyond! 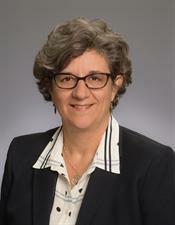 As a faculty member at the School of Medicine and Dentistry, Deborah Cory-Slechta holds professorship positions in the departments of Environmental Medicine, Pediatrics, and Public Health Sciences. 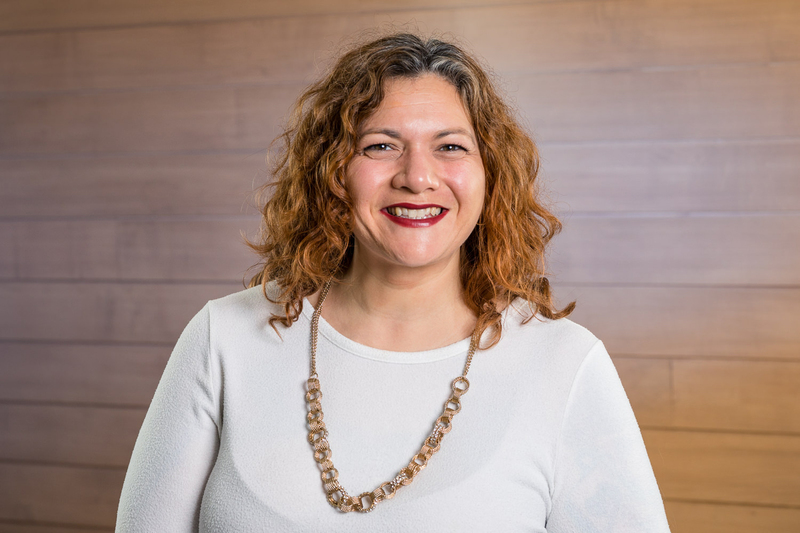 A former chair of the Department of Environmental Medicine and principal investigator of the department’s National Institute of Environmental Health Sciences Center, Cory-Slechta has been nationally and internationally recognized for her scientific contributions. Considered one of the medical school’s most distinguished faculty members, Cory-Slechta served in leadership roles for several Ph.D. programs, where she also teaches key graduate courses. As the recipient of a Women’s Health and the Environment over the Entire Lifespan grant, she oversees a career development and mentoring initiative for junior faculty members. Widely regarded for her research on the consequences of developmental exposures to environmental chemicals on brain development and behavior, she has examined the effects of exposures to metals, pesticides and air pollutants. That work—particularly her groundbreaking research on the biological effects of exposure to lead—has had important regulatory and policy implications. After earning her undergraduate and master’s degree at Western Michigan University, she received her PhD at the University of Minnesota. Following a postdoctoral fellowship at Rochester, she joined the University in 1982. At the annual Undergraduate Research Exposition, students presented projects on topics ranging from fluid dynamics, deforestation in Bolivia, and nomad cultures in Morocco, to prenatal depression, meteorites, and software that affects education. President’s Award winners Lauren Oey ’18 (left), Harrah Newman ’18, Yiyun Huang ’18, and Perry DeMarche ’18 were among the students honored at the event. Ben Plog, Ph.D. has been named the recipient of the distinguished Wallace O. Fenn Award. Named after the late University Physiology professor and chair, the award is given to a graduating student whose Ph.D. research and thesis honor the name and work of Dr. Fenn. Plog was a medical science training program (MSTP) student who entered the Pathology graduate program in 2012 to work in the lab of Maiken Nedergaard, M.D., D.M.Sc. in the Center for Translational Neuromedicine and Neurosurgery. Having defended his thesis (titled Novel Insight into Regulation of Glymphatic Flow with Implications for Traumatic Brain Injury), Plog has returned to Medical School to continue his Medical School training and will be part of 2018 Ph.D. degree conferral. Neuroscience Graduate student Allison Murphy co-authored a paper with the Briggs lab while in a rotation with the lab. Allison contributed an extensive amount of work toward the paper during her fall rotation, and the paper was accepted shortly after her joining the lab. Postdoctoral fellow, Mike Hasse was the first author on the paper, "Morphological heterogeneity among corticogeniculate neurons in ferrets: quantification and comparison with a previous report in macaque monkeys." Nice work Allison and Mike!! One of the many sponsored programs within the Center for Professional Development in the School of Medicine & Dentistry is The Center for the Integration of Research, Teaching and Learning (CIRTL). CIRTL is an NSF-funded consortium of 42 PhD granting institutions around the country, whose aim it is to advance the teaching of STEM disciplines in higher education by preparing future faculty. CIRTL uses graduate and postdoc level research trainees as the leverage point to develop national Science, Technology, Engineering, and Mathematics (STEM) faculty committed to implementing and advancing effective teaching practices for diverse student audiences as part of successful professional careers. 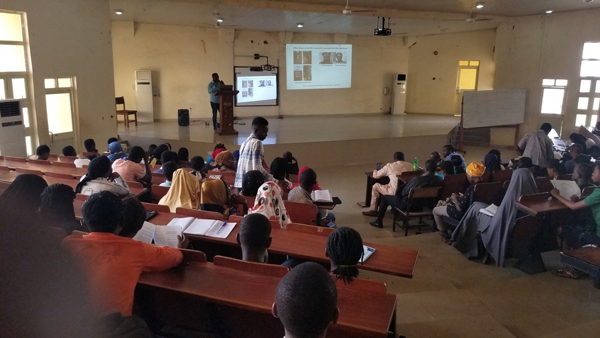 The goal of CIRTL is to improve the STEM learning of all students at every college and university, and thereby to increase the diversity in STEM fields and the STEM literacy of the nation. CIRTL provides a number of online workshops, courses, and educational experiences throughout the year. Graduate students and postdocs interested in teaching are encouraged to participate in CIRTL events. For more information about CIRTL, please visit rochester.edu/college/cetl/cirtl/. Center for the Integration of Research, Teaching and Learning (CIRTL) @ UR will be hosting its annual Research Day and all trainees interested in participating are invited to attend. Kevin Kelly’s LinkedIn profile provides an overview of his work in eLearning. The day’s agenda will include examining teaching through a research lens, optimizing course design, using technology to assess learning in the classroom, using technology to engage diverse learners, and using technology to share course content. Register for this event. Trainees with an interest in teaching are highly encouraged to attend. For a full overview of the days agenda and workshop descriptions, please contact Dr. Jenny Hadingham at jennifer.hadingham@rochester.edu or (585) 276-5998. 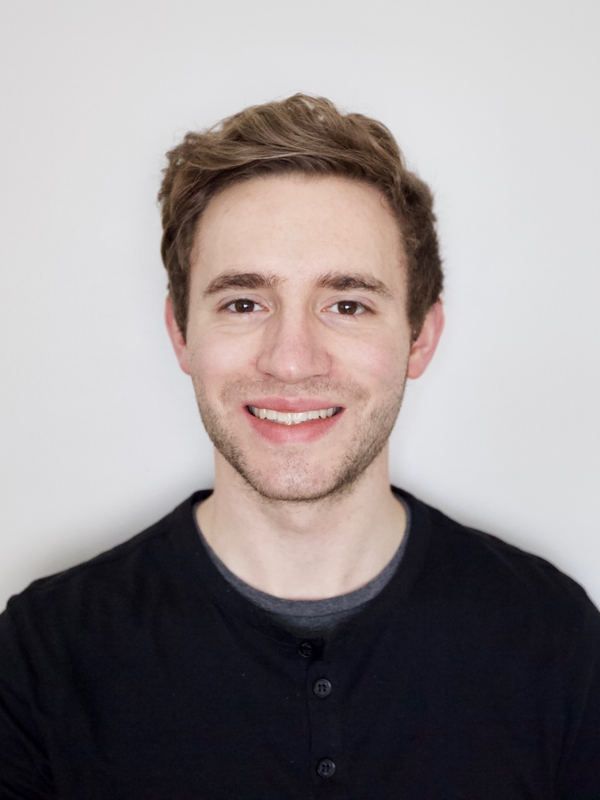 Brandon Berry, graduate student in the laboratory of Dr. Andrew P. Wojtovich was awarded a two-year American Heart Association Predoctoral Fellowship entitled, “Optogenetic Control of Mitochondrial Function to Protect Against Ischemia Reperfusion Injury”. Mitochondria are central mediators of cell death following the pathologic stress of ischemia reperfusion (IR) injury during heart attack or stroke. However, mitochondria can be targeted with specific interventions that inhibit cell death following IR. The mitochondrial protonmotive force (PMF) is coupled to ATP synthesis, and controls ion gradients and oxidative stress. Dissipation of the PMF in IR injury results in cellular damage and death. Interestingly, mild uncoupling of the PMF from ATP synthesis using low-dose protonophores protects against IR injury. It is unclear whether uncoupling triggers protective signaling, or if uncoupling itself is the effector of protection. Further, pharmacologic tools lack temporal and spatial control, obscuring when and where uncoupling is sufficient to protect against IR injury. Uncoupling mitochondria using optogenetics addresses the spatiotemporal challenge of using protonophores. Spatiotemporal control can determine if the mechanism of uncoupling confers protection before ischemia (preconditioning), during ischemia, during reperfusion, or after reperfusion (postconditioning). Overall, using our novel optogenetic tools, this project aims to test how precise, selective, reversible uncoupling is sufficient to elicit cellular responses that protect against IR injury. Kathleen Gates has been awarded an American Heart Association Predoctoral Fellowship. This fellowship is meant to enhance the integrated research and clinical training of promising students who are matriculated in pre-doctoral or clinical health professional degree training programs and who intend careers as scientists, physician-scientists or other clinician-scientists, or related careers aimed at improving global cardiovascular health. Mark your calendars for the 30th annual Genetics Day! The 16th annual Fred Sherman Lecture will be delivered by Michael Eisen, PhD, from Berkeley University. You and your colleagues are invited to submit your posters for the Genetics Day poster session to be held 12:00 – 2:00pm on Monday, April 23, 2018. 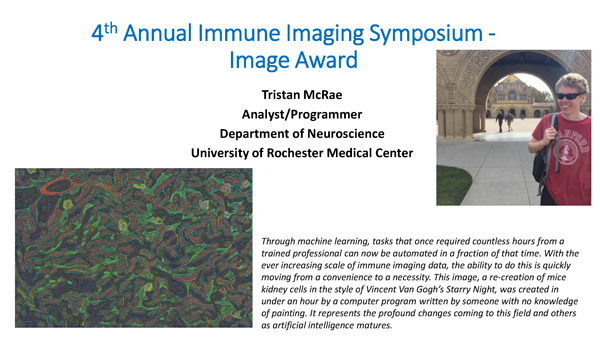 Cash prizes will be awarded to select graduate student and postdoc posters. The Cancer Prevention & Research Institute of Texas (CPRIT) TRIUMPH Postdoctoral Fellowship Program is a post-doctoral program providing unique training in clinical and translational research. The immediate goal of our program is to recruit talented, productive, well-trained PhDs and train them through didactic course work as well as clinical rotations and a unique mentorship to pursue clinical and/or translational research. A long-term goal of this program is to produce scientists who can be paired with suitable physician scientists to co-PI a research laboratory. This is a three-year training program. First year postdoctoral fellows participate in a series of didactic clinical course work offered at the MD Anderson UTHealth Graduate School (GSBS), MD Anderson Cancer Center, or the UTHealth McGovern School of Medicine and strategically matched clinical rotations, while pursuing research in a basic or translational research laboratory. Second and third year fellows are co-mentored by a basic science/translational scientist mentor and a physician/clinical scientist mentor on clinical/translational research projects. The TRIUMPH postdoc will obtain a certificate upon successful completion of the program. The expectation for our post-docs is that by the end of their 3-year training, they will have first authored at least 2 papers in high impact journals. Our multidisciplinary training program will award a certificate upon completion. New Issue of OTE is out! This Wednesday sees a webinar for Genomic Research and the Million Veteran Program on Wednesday, along with the Graduate Student Society Coffee Hour and a All-Network Teaching-as-Research Presentations workshop. Thursday sees the Graduate Women In Science (GWIS) Monthly Meeting: Science Co-Parenting: Raising a Family and a Lab at the Same Time. A campus wide Undergraduate Research Exposition arrives on Friday along with the UP-STAT 2018 Conference which is a two day event going into the weekend. The New Issue has opportunities and events going till the end of May! At a time when it is more important than ever for scientists to communicate clearly with the public, eight University PhD students and postdocs will do their best to summarize their research with just three minutes and a slide. They are finalists in the University’s annual Three Minute Thesis competition, which will be held at 4 p.m., next Thursday, April 12, in the Class of ’62 Auditorium at the Medical Center. The winner will receive a $750 research travel award. There are also $500 and $200 research travel awards, respectively, for the runner-up and the people’s choice winner. 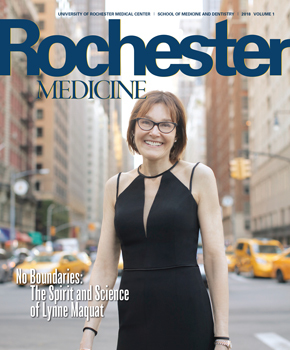 It's an event-filled week at the University of Rochester! The Transgender Health and Wellness 2018 Conference is on Monday along with the online workshop: I Completed My IDP…Now What? Wednesday brings a workshop on Online Learning at The School of Medicine and Dentistry and the Monthly Postdoctoral Association meeting. Thursday sees the Online Teaching workshop move to LeChase Hall on River Campus, there is also an online program covering Inclusive Teaching in Science. The Three Minute Thesis final rounds out Thursday in the Class of '62 Auditorium. Friday brings the 2018 Diversity Conference and workshops on Open Education and making the most of your post-graduate experience. Other events this week include a free online estimated tax workshop, the Gwen M. Green Center offers workshops on obtaining security clearance and renting in NYC. Finally there is a PFCC workshop "The C.A.R.E Effect Movement: The Naked Truth about Compassion is Revealed". That is just this week. The OTE provides information, resources and events throughout the month of April. Dana Olzenak McGuire, who graduated with a PhD in Epidemiology from the 2015 class was recently appointed to the role of public health director in St. Lawrence County. As public health director, Dr. Olzenak McGuire supervises about 30 employees including nurses, the county coroners and administrative staff. Dr. Olzenak McGuire brings a wide range of disciplines into the new role with degrees in Physical therapy, an MBA and the PhD in Epidemiology. Visit our Epidemiology PhD Program to learn more. Congratulations Dana! This week Opportunities to Explore shares news about the Meliora Collective, which will serve as a student and alumni network for collaboration. There is a virtual career fair, The Graduate Student Society coffee hour, a workshop on Connecting with Learners in Digital Classrooms and Meeting Spaces, a free webinar on Making the Most of Your Ph.D. or Postdoc and a workshop on startups. The week is rounded out by the three minute thesis sub heats and a PONS luncheon roundtable. That's just this week, OTE has events and opportunities heading into April/May. Check out the latest issue! The latest issue of Opportunities is out now. This week, Three Minute Thesis (3MT) Competition Registration opens, Graduate Women in Science and the Postdoctoral Association hold their monthly meetings and the week is rounded out with an F-Series and Grant Writing Workshop. For all this weeks events and events heading into April/May 2018, read the latest issue! Dr. Paula Vertino, currently the leader of the Cancer Genetics and Epigenetics Program at Emory University will be joining the University of Rochester Department in Biomedical Genetics and the Wilmot Cancer Institute this summer. Dr. Vertino's research on cancer epigenetics will greatly expand our areas of research strengths. She is an exceptionally important player in her field, and we look forward to welcoming her to the GDSC program! To read more about Cindy’s proposal and the competition, please visit the CTSI Stories website. A new issue of Opportunities to Explore is out! This week a workshop on encouraging learner interaction starts the week along with a Pre-Application webinar for T32 grants. Tuesday sees a career story with Michael Brady, PhD and a China Career Expo.There are tax related events rounding out the week for students and postdocs. And that's just this week, we have events heading into the end of April. That's just this week! This issue provides you with things to attend well into April. This weeks events in opportunities to explore there is a career event for postdocs, a faculty development workshop about teaching and learning in a digital age, a career story by Teresa Long and information on leveraging linked in. 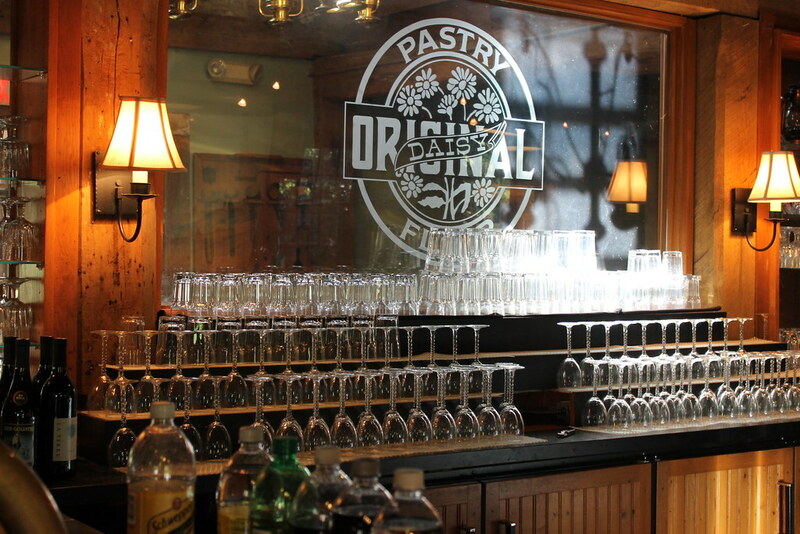 The week is rounded out by the second interview weekend at SMD and the PDA winter social. A new study led by the Rahman lab and first author, Toxicology post-doctoral researcher, Dr. Thivanka Muthumalage, adds to growing evidence on the harmful health effects of e-cigarettes. Currently, the article has been viewed over 16,500 times (in just one day) and several news sources have written articles and reported about it across the globe. The paper has been so well received that it is currently ranked in the top 5% of all research outputs ever tracked by Altmetric. The study has revealed another potential health risk of e-cigarettes, finding that the chemicals used to flavour e-cigarette liquids are toxic to white blood cells. The study wanted to test the assumption that nicotine-free flavoured e-liquids are safer than smoking tobacco cigarettes, looking at what effect e-cigs might have on the immune system. To do this the researchers directly exposed a type of white blood cell called monocytes, which help the body fight infection, to e-liquids. They found that e-cigarette flavoring chemicals and liquids can cause significant inflammation to monocytes, with many of the flavouring chemicals also causing significant cell death. Some flavours were found to be more harmful than others, with cinnamon, vanilla, and buttery flavours among the worst. The researchers also found that mixing e-cigarette flavours has a much worse effect than exposure to just one flavour and caused the most toxicity to white blood cells. The study's first author, Dr. Thivanka Muthumalage, commented on the findings, saying that although these flavouring compounds may be safe for ingestion, the results show they are not safe for inhalation and add to a growing body of evidence suggesting that e-cigarettes are harmful to health. Previous research has also found that the flavors used in e-cigarettes cause inflammatory and oxidative stress responses in lung cells. The team are now planning further research and are calling for further long-term human studies to understand better the harmful effects of e-cigarettes. The findings can be found published online in the journal Frontiers in Physiology. The harm caused by a stroke can be exacerbated when immune cells rush to the brain an inadvertently make the situation worse. Researchers at the University of Rochester Medical Center (URMC) are studying new ways to head off this second wave of brain damage by using the lungs to moderate the immune system’s response. Halterman’s lab, which is part of the Center for NeuroTherapeutics Discovery, has been investigating domino effect that occurs after cardiac arrest. When blood circulation is interrupted, the integrity of our intestines becomes compromised, releasing bacteria that reside in the gut into the blood stream. This prompts a massive immune response which can cause systemic inflammation, making a bad situation worse. While looking at mouse models of stroke, his lab observed that a similar phenomenon occurs. During a stroke blood vessels in the brain leak and the proteins that comprise the wreckage of damaged neurons and glia cells in the brain make their way into blood stream. The immune system, which is not used to seeing these proteins in circulation, responds to these damage-associated molecular patterns and ramps up to respond. Mobilized immune cells make their way into the brain and, finding no infection, nevertheless trigger inflammation and attack healthy tissue, compounding the damage. The culprit in this system-wide immune response is neutrophils, a white cell in the blood system that serves as the shock troops of the body’s immune system. Because our entire blood supply constantly circulates through the lungs, the organ serves as an important way station for neutrophils. It is here that the cells are often primed and instructed to go search for new infections. The activated neutrophils can also cause inflammation in the lungs, which Halterman suspects may be mistakenly identified as post-stroke pneumonia. The damage caused by activated neutrophils can also spread to other organs including the kidneys, and liver. MD/PhD student, Andrew Cox has been awarded a patent, "Attenuated Influenza Vaccines and Uses Thereof" (9,787,032), for a new live flu vaccine that is safer than the current one so should permit higher dose administration to overcome the current problems with the live vaccine. When not in medical school, Andrew is currently pursuing his degree in the Dewhurst lab, working on temperature sensitivity of Influenza polymerase as a determinant of pathogenicity. The Center for Professional Development (CPD) is excited to announce this year’s winners of the CPD Travel Award. Congratulations to Valeriia Sherina, PhD student in Statistics and Cui Li, postdoctoral appointee in the Center for Translational Neuromedicine, for winning the inaugural CPD Travel Award! CPD would like to thank all the PhD students and postdoctoral appointees who submitted applications. Applications for the 2018-2019 academic year will be available in early spring. The Center of Professional Development (CPD) is sponsoring a CPD Travel Award for PhD students and postdoctoral appointees in the School of Medicine and Dentistry. Each travel award is worth up to $1500 and can be utilized for travel to a conference or for a professional development opportunity relevant to preparation for current or future career endeavors. This week in Opportunities to Explore there is the future faculty workshop, a benefit play for humans for education, the grand gesture with URBEST and finally the Graduate Student Society Gala, being held at the Hilton Garden Inn. Looking further out, there are workshops on online teaching, linked in, help with career fairs and more. Teresa Long, MS will be sharing her career story. There are employment opportunities, conferences and programs to apply/register for. This issue of OTE is packed with events. There are workshops for investing and Job searches, with a anti human trafficking conference rounding out the week. further into the issue you will find information on career focused events, teaching, research, mentoring and more! Check out new employment opportunities available at AMRI and Cardiocore. The first of two SMD Interview Weekends starts on Thursday, January 18th. SMD graduate students and postdoctoral associates are invited to attend a special guest day for the University of Rochester’s Toastmasters Club, Daybreakers, on Thursday, January 18th. Check out new employment opportunities available in Western New York at AMRI. Stowell’s most recent creation (above) is based on research which has recently been published in the journal Developmental Neurobiology and sheds new light on the role that immune cells called microglia play in wiring and rewiring the connections between nerve cells. Stowell recalls wanting to pursue a career in art as far back as elementary school in Pennsylvania and while she carried that desire with her to Moravian College, she also began to explore other academic fields. Her interest in biology and psychology attracted her to a degree in neuroscience and that decision ultimately led her to the University of Rochester School of Medicine and Dentistry, where she is in now in her fourth year of graduate studies in pursuit of her Ph.D. in neuroscience. The Undergraduate Placement Program is seeing graduate and postdoctoral associates to serve as mentors to undergraduate students focusing on health and life sciences. Graduate Women in Science GWIS will be hosting a presentation entitled “Tales from the Other Side: My Experience working in Industry” by Melanie Preston, Ph.D., SMD graduate of 2009 and postdoctoral associate from 2009-2010.